Finals of the first National Championship for Waiters. 1. The Competition may be attended solely by natural persons of age who have been working as waiters for a minimum of 3 years, documented with employment certificates. In order to participate in the Competition, an enrolment form has to be completed and a multiple-choice test has to be passed along with two questions attached to the enrolment form and submitted by 15.12.2017. 2. The Participants identified by the Organiser during the qualification stage will attend the second Competition stage to be held on 16.01.2018 at the Culinary Centre in Chorzów, ul. Adamieckiego 8, 9.00 am. 3. From among enrolment requests and tests, the Competition Jury appointed by the Organiser will identify 12 Participants by 22.12.2017. 5. The finals will be attended by the six Participants with the highest scores, identified by the Competition Jury after the second stage. The third Competition stage – the finals – will be held during Gastrosilesia/FOOD SHOW at the International Congress Centre (MCK) on 13.03.2018 at 10.00 am. Maciej Dobrzyniecki, President Founder of the Culinary Academy in Poland, a Polish entrepreneur, deputy President of the Management Board of Business Centre Club, honorary council of the Kingdom of Spain. Szymon Kohut, Master Waiter. The initiator, founder and owner of the Cracow School of Restaurateurs, organiser of multiple HoReCa courses and training in Kraków and all over Poland. A coach in the restaurant art in catering and other areas. Chief organiser of the Kraków Waiters Run. Bernard Sitarski, Deputy President of the Polish Waiter Association, lecturer and co-author of waiter training projects under the patronage of centres involved in training of catering employees in Poland, an enthusiast in the art of wine serving and selection, co-author of training programs for waiters and sommeliers and training organiser. Bogdan Migas, a leading Polish sommelier. He organises training on wine, cooperates with the Office of the Council of Ministers, Business Center Club and services events with the attendance of top state authorities in the Presidential Palace. He has obtained a diploma issued by the President of the International Sommelier Federation. He used to operate a wine salon for one of the best wine companies in Poland. Rafał Adamek, Poland's Barista Champion, certified SCAE barista, participant of the World Barista Championship 2006, Berne, participant of the Team European Championship Moscow 2007, second position in the Coffee Flair Challenge 2008, Trieste, certificate of an authorised Procaffe trainer in Poland, brand Ambassador of Bristot in Poland. Artur Grzęda, Member of the examination committee of the Chamber of Crafts for Small and Medium Enterprises in Katowice, a certified IBA Bartender. He gained his professional experience in renowned restaurants in Silesia. HoReCa Manager at Weindich. 8. The finals with valuable prizes will be held on 13.03.2018 at MCK in Katowice during the largest catering event Gastrosilesia/Food Show. 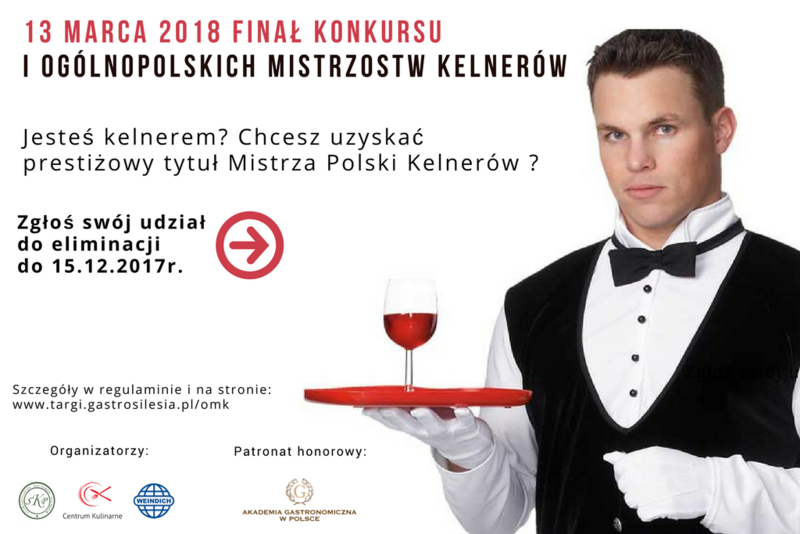 Tytułu i certyfikatu: Mistrz Kelnerów Polski 2018 r.
Culinary Centre Voucher for a selected training at a selected time for PLN 250 gross. Culinary Centre Voucher for a selected training at a selected time for PLN 200 gross. Culinary Centre Voucher for a selected training at a selected time for PLN 150 gross.